ResQWalk (left) and Charity Miles (right) are two mobile apps that turn miles walked into charitable donations to a variety of causes, including animal shelters. If you take daily walks to stay in shape, you can help shelter cats and dogs. And the best part is it takes very little effort. Oh, did we mention you don’t have to open your wallet. Most of us walk and jog with our cell phones either in our pockets or hooked onto a belt or accessory. By simply uploading an app that tracks your steps, you can program it to donate steps for dollars. 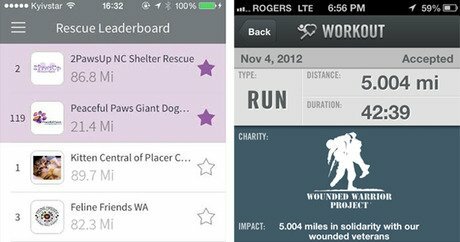 ResQWalk and Charity Miles are two such apps that are free and easy to program. Charity Miles has an app that benefits the ASPCA (American Society for the Protection of Cruelty to Animals); ResQWalk benefits several different rescues and animal shelters. You can organize your rescue to be part of their program at no cost to you. “Our vision is to give people a platform that enables them to easily integrate giving into their daily routine,” Bailey Schroeder, founder of ResQWalk, tells DogTime. “Often people don’t have the time to foster a cat, the space to adopt a dog, or the time to volunteer. ResQwalk gives everyone the opportunity to help animals in need on a daily basis without disrupting their regular schedules. ResQWalk also hosts Weekly Rescue challenges where different groups are invited to participate and receive bonus money. Last week, several dog rescue groups competed for an additional $175. Charity Miles has a number of charitable organizations you can donate to. The ASPCA is their program that helps animals; other nonprofits they benefit include Autism Speaks, Wounded Warrior Project, Feeding America, and others. The donations are funded by corporate sponsorship dollars and sales generated in the shop section of the apps.